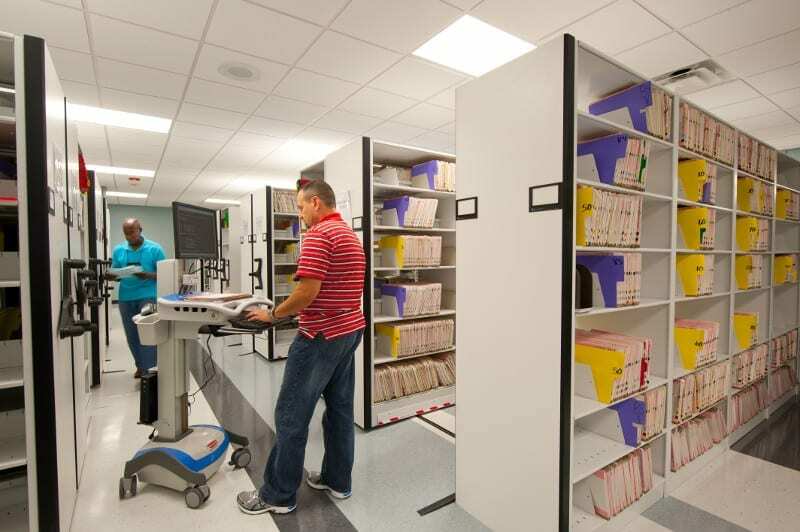 Less hospital storage challenges, more time for patients. Nurses, pharmacists, lab technicians—we’re pretty sure they didn’t get into healthcare to think about storage challenges. Yet, everyday space constraints and disorganized stockrooms cause them to spend more time hunting for supplies and less time caring for patients. As medications, equipment, supplies, and files continue to grow, it may seem impossible for your facility to keep up. 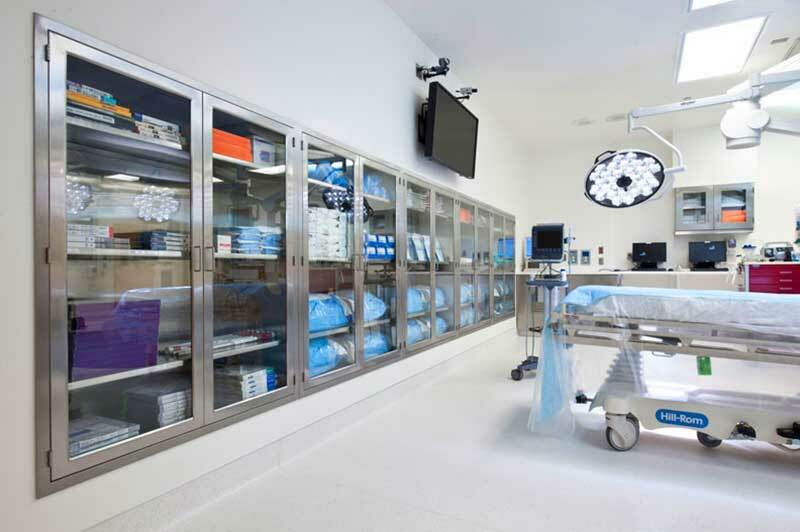 With years of experience designing healthcare and hospital storage for facilities in Illinois, Indiana, and Missouri, we understand how to manage that endless growth. The John H. Stroger Jr. Hospital of Cook County in Chicago was planning a significant remodel to meet the needs of patients as well as include the most up-to-date technology and efficient design in a contemporary setting. With this goal, the hospital realized they needed to take an extra-close look at space efficiencies—and when they called, we were ready to help them with their challenges. Space-efficient solutions were planned throughout 74 areas of the 1.2 million square foot facility, with material storage applications ranging from small, high-priced vials of narcotics to large bulky cleaning supplies. A total of eight high-density compact storage systems were used for the bulk pharmacy, clinical engineering, investigative drugs, mammography, and more. Synchronized carriages eliminated aisle space and featured slow movement to ensure fragile items stay in place on the shelves. 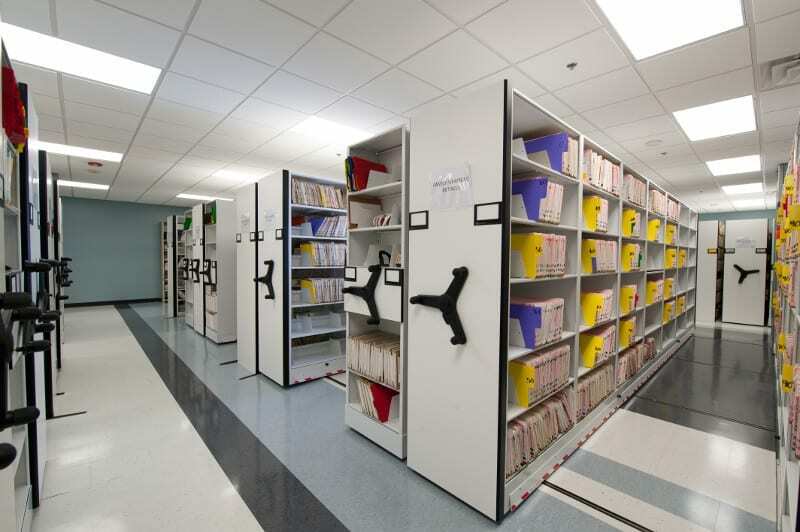 In addition to the compact mobile storage utilized in the hospital, stationary shelving is used in an additional 50 areas including bulk storage, the pharmacy workroom, and general storage in offices. In the case of the pharmaceutical storage, fast-mover sorter shelves were incorporated on the ends of each shelving range to keep active stock up front and maximize speedy retrieval of drugs and supplies. If there’s one thing you can usually depend on, it’s that inventory always changes. 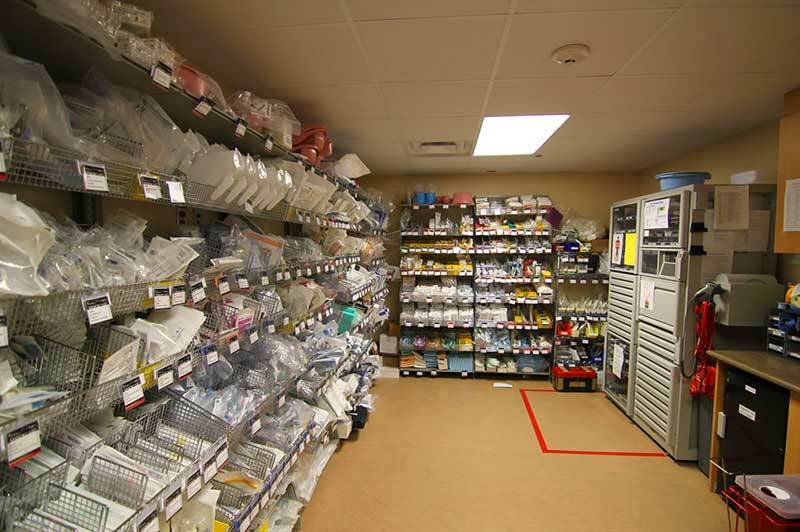 With a modular bin storage system, medications and supplies can be organized in the way that makes the most sense to you, and improves work flow by giving your staff direct access to what they need, when they need it. 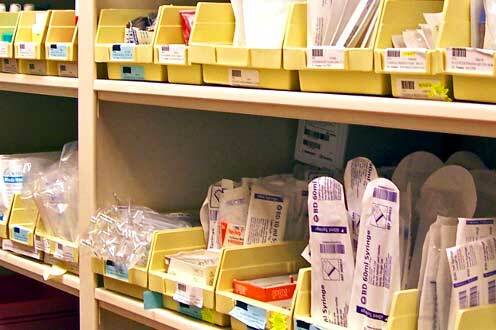 We offer a range of additional supply solutions, including materials management and medical file storage. Learn more about our pharmacy services and materials management services, or download the brochure for more information on modular bin storage. When we ask nurses what they need the most during their busy workdays, they all answer the same way—they need just a few more hours in the day. Part of their time is spent tracking down supplies and medications, leading to a decrease in the time they can spend with patients. A nurse server helps improve patient care by providing access to medical supplies inside and outside a patient’s room—leading to ease in stocking, less patient disruptions, and supplies right where they need to be.